Some might argue that a job title doesn’t have a lot of weight, and that a true measure of someone’s success is their motivation, tenacity and willingness to do whatever it takes to get the job done. Steph LeBlanc is a unique case, however, as the key descriptor in her title — customer success — is what drives her to succeed, day after day. So how did Steph go from selling blinds to managing a team of 20+ and overseeing virtually all activities for our clients? Take a look at our Q&A with Steph and learn about her interesting career experience, daily inspirations, and path to #LifeIQ. I’m originally from the South Shore (Candiac), and I moved into the city when I was 23. Fun fact: I never thought I would move back to the suburbs — but I’m back there now, with my husband and my two kids! How did you get your career off the ground? I was always interested in the business and marketing space, so I studied at John Molson School of Business at Concordia University, where I majored in marketing. After JMSB, my first “real” job was selling blinds; I finished university during the recession, so my only option was to learn how to sell blinds — and sell a lot of them, to anyone. From blinds to… local marketing? How did that happen? Well, after selling blinds, I landed a sales opportunity at Yellow Pages. From there, my career moved pretty quickly: I was the highest performing sales rep within six months. Eventually, I was managing a 1.3M portfolio, uprooted my life and moved to Ottawa where I managed clients in both Ontario and Quebec. That must have been an interesting time to be at YP as the digital transformation was taking place. It was extremely interesting — and I was eventually at the heart of it, right in the weeds with the team: I moved back to the Montreal office and managed the graphic designers who were moving from print to digital. At the time, I wanted a new challenge, which, in retrospect, really primed me for working in a fast-paced environment. I know you’re super passionate about ensuring your clients have continued success — from signing to deep into their relationship with the company. Where did you develop this drive? I was was leading a pilot for an Accounts team at YP, a test which was divided by region. I created a team from the ground up and was responsible for all Tier 1 clients, and hired people from West to East and managed them for just over two years — before finding my way to SweetIQ. I always viewed things from the client perspective to really empathize with them and their needs. In this role, I really preached to the people on my team how important it was to understand the value of a client’s dollar, and to do everything you can to make the most of it. That’s our job. 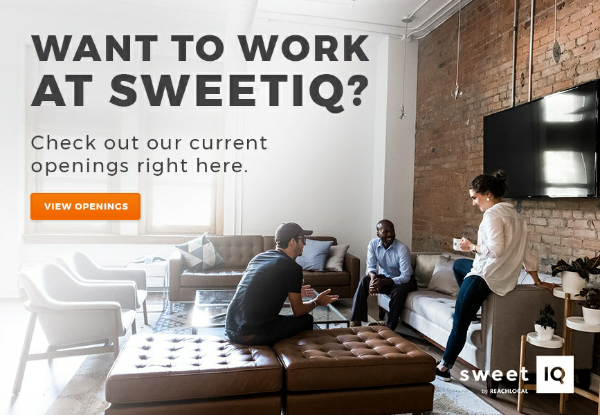 How did you learn about SweetIQ? I had known a couple of former colleagues who made their way here — Emilie Fournelle and Liz McConomy. I had meetings with key stakeholders, and I was very, very struck by the company’s DNA. Knowing that SweetIQ was in an intense moment of growth, the fact that I could have a major impact on that trajectory was very attractive to me. Well, at the time, we weren’t in our amazing new offices (laughs.) It’s a very hands-on environment (I was building IKEA desks on my first week), and everyone was welcoming and excited. Within 24hrs of being a part of the team I knew I had made the right decision. I’m the kind of person who jumps in with both feet right away — and rolls with it! What’s the biggest difference between an “old” established company versus a “new” company? SweetIQ is very lean, which allows us to be agile in just about everything we do. If a solution or an idea comes to you one day, it could be implemented next week. The level of autonomy and accountability is high, which allows you to clearly identify successes and failures. For young companies, the stakes are high, and so is the energy! There is plenty of brainstorming and collaboration with my team! I do everything in my power to ensure we are providing a world-class customer experience, from the moment they choose SweetIQ, to onboarding, strategizing, and onwards. I oversee brand accounts and agency accounts, as well as 24-7 customer support. It was an extremely tactical piece of advice from someone during my early days at YP. It was the end of the day, and she was leaving work and said, “If there is anything left to do and you can do it now, just do it. Don’t wait until the next day!” Being able to optimize every minute of the day has been instrumental to my success. LifeIQ: What advice do you give to your team? I always, always, always harp the importance of putting oneself in the shoes of the customer. You have to respect their day to day, and know that their investment of time is immensely important. The people behind the brands and agencies we come across work extremely hard, and we need to do everything to help the partnership thrive. #LocalIQ: Now… back to where we began: what’s your favorite spot in Montreal? Oh, that’s a tough one. I would say Strom Spa to find a slice of quietude, and the Lachine Canal when I’m with the family.